A mola mola, also known as an ocean sunfish, swims in deep water off the mid-Atlantic coast in 2013. Some people have reported them as sharks, and some even have thought they were severed whale heads, but most everyone that has seen one agrees on one thing: there’s a bizarre looking fish showing up in heavy numbers along the Maine coast this summer. Also known as ocean sunfish, mola are the largest bony fish in the world, often growing to more than 2,000 pounds and sometimes topping 5,000 pounds. Mola, which is Latin for “millstone,” are known for their large size and odd shape, which looks more like a gigantic fish head with fins than an actual fish. They are commonly sighted off New England each summer, but this year social media has been relatively inundated with video and photos of the bizarre fish recorded by boaters in the Gulf of Maine. Some fishermen said they have seen “dozens” of them on fishing trips off the coast. Toby Stephenson, captain of College of the Atlantic’s vessel Osprey, said on some trips off Mount Desert Island this summer he and his passengers have seen as many as 20 sunfish. He said the sightings have coincided with large numbers of jellyfish and jellyfish-like ctenophores. IT’S A BABY WHALE BRO! Not really, it’s not even a marine mammal. This odd looking animal is called an Ocean Sunfish, or Mola mola. We spotted this one on a recent research cruise near Mount Desert Rock. This animal is smaller and has a more mottled skin pattern than most Mola mola regularly sighted. Adult Mola usually weigh between 550 – 2,200 lbs (250 – 1,000 kg) and are roughly 8.2 feet by 5.9 feet long. The heaviest Mola recorded weighed a whopping 5,071 lbs! That’s about the size of a full-grown white rhinoceros. He said that not only do there seem to be more in the gulf, but that they are making themselves more visible by breaching — swimming forcibly up out of the water and then diving back down again — more than he can recall in the past. Nick Record, a scientist at Bigelow Laboratory in Boothbay, said recently that he’s heard anecdotally that there have been a lot of sightings of the unusual fish off the Maine coast. Record doesn’t track mola sightings, but he does keep tabs on sea jelly blooms, which he said may be a draw for mola, which are known to eat jellyfish. “They’re so alien looking,” Record said of mola mola. Record said he has been getting a lot of citizen reports this summer of jelly sightings in the gulf, particularly of lion’s mane jellies, which have a reddish-orange color and can grow to 3 feet or more in width. He tallies such reports on a web page on Bigelow Laboratory’s website. He said that he remembers getting reports of mola sightings in the gulf in 2015, which was “also a boom year for jellyfish.” Sightings dipped in 2016 and 2017 but have climbed back up this summer. Record said mola also are believed to eat algae and perhaps squid, though scientists are not sure what their primary food source might be. He said not much is known about the “eye-catching” fish, compared to other marine species that are protected or commercially harvested, Still, they still draw a lot of attention because they often swim lazily at the surface, where their fins can been flapping in the water. “They can swim at a pretty good clip when they want to,” Record said. Carol “Krill” Carson is the director of the New England Basking Shark and Ocean Sunfish Project, which is based in southeast Massachusetts. She said she often gets calls from people who aren’t sure what they are seeing. She said she has gotten “three or four” reports of sunfish sightings from Maine this summer, which is more than she usually gets, but that could simply reflect a growing awareness of her organization rather than an increase of sunfish along the Maine coast. 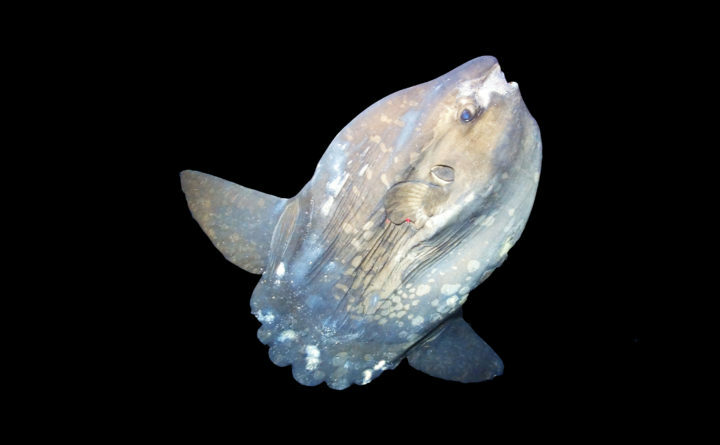 The project to document sightings of the two types of large fish, which derive their names from their tendency to hang out at the ocean surface, was established in 2005. But she did say that there has been an uptick in mola strandings in Cape Cod Bay, which is connected to the gulf. Like sea turtles, she said, mola get stuck in the bay every fall and early winter, when cooling ocean temperatures cause them to head back south. The ones that swim east of Cape Cod can make the return trip to warmer waters unhindered, but those that swim west of the peninsula become stranded along its north-facing shore. Last fall, Carson said, she was notified of more than 60 separate sunfish that got stuck in the bay, which is at least 20 more than she ever got before. The increase in strandings could reflect an increase in the number of sunfish in the gulf, she said, but she can’t be sure. The Gulf of Maine is getting warmer more quickly than almost all other parts of the world’s oceans, Carson said, but it isn’t clear whether this is having a direct impact on what kind of creatures appear in the gulf each summer. “We just don’t know,” she said.